I was excited to head to the post office counter yesterday with my yellow slip. In our little town that, of course, means you have a package to pick up! I handed the piece of paper to the man on the other side of the counter with a big smile and then stood there to wait. He came around the corner with a box and blandly stated, "more hunting things." I immediately knew what was inside. It was going to be my new mini Phantom combo kit from Extreme Dimension Wildlife Calls. An electronic predator call which I planned to try it out on the coyotes that have been lurking around looking for our turkey. They are continually waking me up in the evening just after I fall asleep and in the morning just before the alarm has a chance to sound. 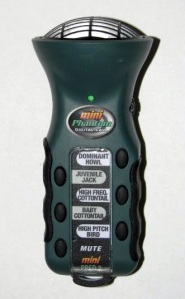 I am very pleased that at 5 inches, the mini Phantom call is small enough that it can easily fit into my vest pocket. The contoured non-slip grip fits easily into my small hand' still allowing ease of operation. The mini has a terrific volume range that is clear all the way up to its maximum, 10db. The volume control is easy to operate with the roll of your thumb while you can still reach to press the individual buttons of each sound with little to no movement seen in the field. The sound sticks that came with the mini Phantom Combo Kit are stout and durable. 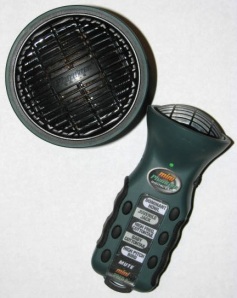 Each stick contains five calls and the electronic call can even play two sounds at one time. The sounds overlap to mimic two animals interacting in the field. You can have squealing and snarling simultaneously. With a simple pull and swap you can put a new sound stick into the mini with tremendous ease. There are no screws or covers to remove or lose in changing the sound sticks. One flaw I see is that there is no great spot to store the unused sound sticks other than in my jacket pocket. I suppose I will have to designate a pocket specifically to the precious items so they are not lost in the field when I am pulling other items from my pockets. Fortunately, I can always purchase additional sound sticks separately, if necessary. Extreme Dimension has a total of 13 different sound sticks available. With the mini Phantom Combo Kit, I also received the mini Phantom Speaker. It is an optional item that can be purchased separate if you don't want the kit. It interested me, because it comes with a 25' cord that allows me to place the speaker away from my location and call predators with out them looking directly at me when sounds are playing. The speaker conveniently has the option to attach to the mini, which in my opinion makes it easy to carry the two together. I do regret that there is no storage hook or container for the speaker cord. So far I have had no grief with it, but I will have to test it out on long trips in my pack to find an easy way to store the cord without knots or kinks. For now, I have simply resorted to attaching the speaker to the mini and then wrapping it around the mini's contoured handle. All in all, the mini Phantom Combo Kit by Extreme Dimension Wildlife Calls is even better than I had anticipated. The mini Phantom is a digital predator call that is compact, easy to set up and use and is extremely realistic sounding. We took the call out right away and set up near the back pond with the speaker 25' away from us. We pressed a button initiating some howling. A moment later I selected another button and squealing and snarling sounds emitted. In fewer than five minutes we had a bobcat headed our way. Once I have time to take a break from my new Extreme Dimension call, or at least get one or two of those pesky coyotes, I will have to sit a while and watch the bonus CD that came with it! Find out more about the mini Phantom combo kit from Extreme Dimension Wildlife Calls.